A VISIT by female icon, national favourite and one of the country’s most popular actresses, Sheila Hancock, kicks off the Guildford Book Festival on Sunday (October 12). While her acting career spans the decades from the 1950s, she has just written her first novel, Miss Carter’s War, and will be at the Yvonne Arnaud Theatre to promote it. Sheila’s first book, Ramblings of an Actress, was published in 1987. 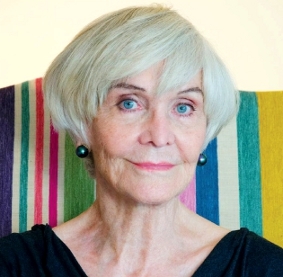 Following the death of her husband, John Thaw, she wrote a memoir of their marriage, The Two of Us, which was a number one bestseller and won the British Book Award for Author of the Year. Her acclaimed memoir of her widowhood, Just Me, also a bestseller, was published in 2007. But Miss Carter’s War, which presents a powerful and panoramic portrait of post-war Britain, is her first fictional novel. It is 1948 and Britain is struggling to recover from the Second World War. Home from working for SOE behind enemy lines in France, Marguerite Carter has become one of the first women to receive a degree from the University of Cambridge. Now she pins back her unruly curls, draws a pencil seam up her legs, belts up her grey gabardine mac and sets out on her future as an English teacher in a girl’s grammar school. For Miss Carter has a mission – to fight social injustice, to prevent war and to educate her girls. From the first Aldermaston march in the 1950s, through the rise of the Labour Party and the Swinging Sixties to the AIDS epidemic of the ’80s and the spectre of a new war in Iraq, through deep friendships and love lost and found, in telling the life of one woman, Sheila Hancock has created a chronicle of our life and times. GUILDFORD Book Festival will also see visits to the city by Paul Merton, Kate Adie, Kathy Lette, Kevin Pietersen, Kate Mosse and many others at several venues. For full details go online to www.guildfordbookfestival.co.uk.